It’s not often that college students get an opportunity to visit NASA. 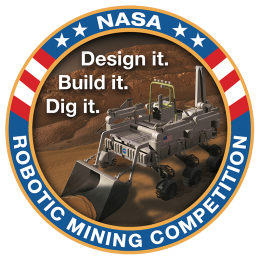 But five Wright State students will get that chance when they participate NASA’s Robotic Mining Competition at the Kennedy Space Center in Florida from May 22 to May 26. 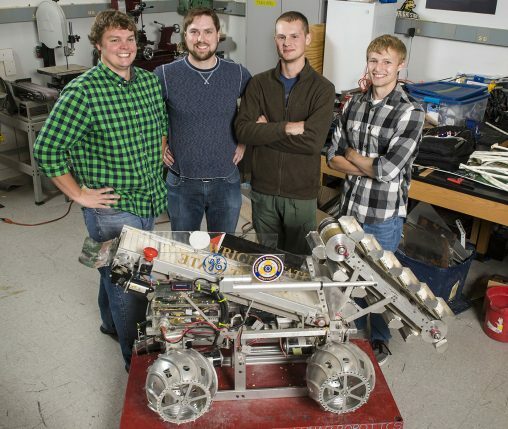 The Wright State Robotics Club includes Ryan Hendrickson, Tyler Doerman, Brian Shivers and Michael Wagner, who are mechanical engineering majors, and Logan Rickert, a computer science major. This will be the fourth year Wright State students will participate in the competition. The team will enter into the competition a modified and updated robot designed by previous Robotics Club members. Significant changes this year’s team made to the robot include reducing the weight by 10 kilograms. “NASA needs new ideas for mining with water 13 centimeters into the ground to mine to get to the ice,” said Hendrickson, who serves as the leader of Robotics Club. Fifty teams representing colleges and universities from around the country will participate in the competition, including teams from Purdue University, Case Western Reserve University, the University of Florida and Virginia Tech. Hendrickson hopes the Wright State team can place in the top 10. Following one of the competition requirements, the Robotics Club has been active in the community by giving presentations about the robot to local middle school classes. Hendrickson the middle school students were often impressed with their presentation, and one student was even surprised that college students could build a robot. NASA applies designs by students in the competition into the agency’s own robotic engineering to discover more about water on Mars. Competitors must build a robot that can be controlled from a distance since the robot must dig through a deadly substance. Students can increase points if they design a self-controlled robot. Wright State’s Robotic Club is currently using two X-BOX 360 controllers that are connected to a laptop to operate its robot. Winning or placing well in the competition would advance recognition of Wright State’s engineering program. “Wright State is a smaller school, but Wright State has been beating these schools and are competing, if not leading, these bigger names,” Hendrickson said. Wright State’s Robotics Club consists of undergraduate students, whereas other schools send graduate students to participate. Hendrickson and his teammates are looking forward to applying what they have learned into practice on a larger and advanced scale. Hendrickson’s goals for the team include improving robot and seeing how their work pays off. “We have a lot of work to do from now and then, and we hope to improve the score,” Hendrickson said. The project is supported by the College of Engineering and Computer Science and from donations from engineering companies.